Smoke exhaust system - is one of the most important elements of the object's fire protection. Smoke exhaust is necessary wherein high concentration of smoke or dangerous to health gaseous substances can be generated in case of fire development. The central task of such systems - to make sure that evacuation and rescue activities will be safe. Usually, gravitational smoke exhaust and forced smoke exhaust systems are distinguished. For gravitational smoke exhaust BK Company LLC offers to use equipment of famous company Mercor. First of all, this is the so-called rooflights with smoke exhausting functionality. 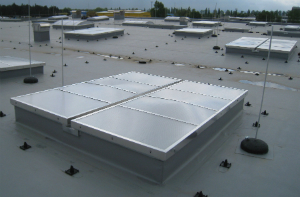 These rooflights provide additional lighting and, due to automatic opening, protect premises against smoke and excessive temperature increase in case of fire, therefore providing proper conditions for evacuation and rescue activities. Smoke exhaust is done by means of control system, which controls pneumatic or electric drive. Choice of drive depends on demands, put forward by regulations, on the object nature and financial capacities of investors. 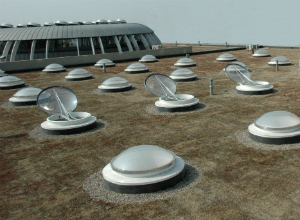 Special mount system allows opening the dome of the rooflight more than by 140о. Gravitational smoke exhaust system can be used not only in emergency situations, but also for everyday ventilation of the premises. Using of such feature of the system is very important for crowded places. Moreover, it allows to regulate the humidity level in the part of building under the roof and consequently to protect constructions against damaging effect of condensate. 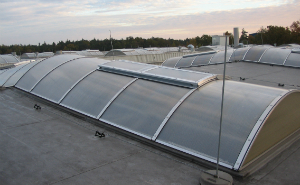 Automatic equipment will close the rooflight in case of rain, snow or strong wind. For industrial objects, such as warehouses, shopping or industrial premises, the light lines can be placed above passages or areas, requiring intensive additional lighting. This allows reducing the necessity of artificial light application. And where the aesthetical treatment of objects is needed, for example in offices, conference-halls etc., it is possible to use the installment of so-called conference lights, which produce an effect of soft diffused light. Forced smoke exhaust systems is installed in compliance with the fire safety regulations and with the construction rules in high buildings, as well as in underground structures and in premises, where natural ventilation is impossible. Such systems consist of air ducts (channels, chambers) with installed chimney valves or air ducts with outlets for acceptance of smoke and with chimney valves, common for smoke area, smoke reservoir or premise. If complex approach, ensured by our specialists, is applied to design and mounting, the smoke exhaust systems are easily integrated with any security and dispatch systems. This allows to significantly decrease its cost in general and to increase the effectiveness. For specialized organizations, which render services on mounting and adjusting of fire protection systems, the BK Company offers supply of equipment and consultations concerning its installation and operation.